The Physics Section of the University of Geneva is continuing its series of lectures, open to the general public, on the most recent developments in the field of physics. 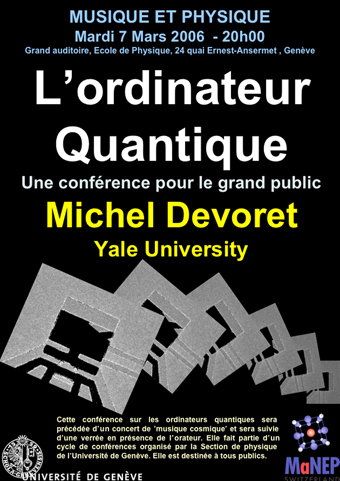 The next lecture, given by Professor Michel Devoret of Yale University in the United States, will be on the potential of the quantum computer. The quantum computer is, as yet, a hypothetical machine which would operate on the basic principles of quantum mechanics. Compared to standard computers, it represents a significant gain in computing power for certain complex calculations. Quantum operations can simultaneously explore a very large number of possibilities. The correction of quantum errors, which until recently had been deemed impossible, has now become a well-established technique. Several prototypes for, as yet, very simple quantum processors have been developed. The lecture will begin with a demonstration in the auditorium of the detection of cosmic rays and, in collaboration with Professor E. Ellberger of the Conservatoire de Musique de Genève, of how these signals can be used to create 'cosmic music'. L'ordinateur quantique : miracle ou mirage ? 7 March 2006, from 8.00 p.m.